Peaches now has a matching coin purse! The rest of us are a bit jealous that nobody has made any featuring our likenesses, they should make one for each and every piggy hmph. 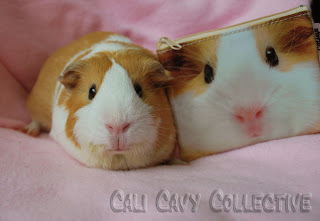 Our humans happened upon it when they searched for "guinea pig coin purse" on ebay. As soon as they saw it they knew they had to buy it because the piggy looked so much like our Peaches. As for us pigs, we just hope that whenever they see it they will remember to buy us lots of food. A friendly reminder, if you will. Peaches graciously agreed to pose for some pigtures with it side by side. Don't they look alike? Whee certainly think so! 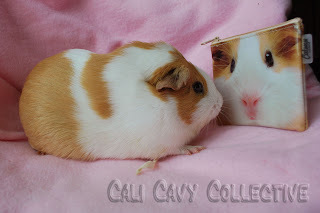 "Mirror, mirror, on the wall, who's the prettiest piggy of them all?"